Friday night was Salsa dancing with the stars. I attended a Superstars of Ballroom Dance Salsa event hosted by Tony Dovolani from the show Dancing with the Stars. A live Salsa band hand the crowd shaking it on the dance floor all night. Although I don't claim to be a expert in Salsa dancing, I can keep up pretty well! Salsa dancing is no joke, I woke up sore. If you want a good full body workout I totally recommend Salsa dancing, its time for some lessons. I wasn't sure what to wear since the last time I went out dancing was about 5 or 6 yrs ago! Yeah I know that's too long...well do weddings count as going dancing! LOL I had this dress from Sizes to Fit that was gifted from Viva Fat Vegas, it was time to bring it out. 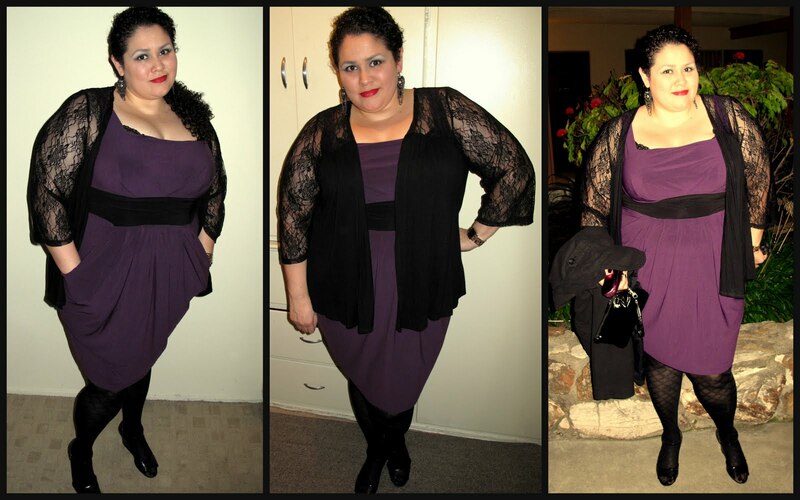 I like the fit of the dress but because its sleeveless I added the lace cardigan over it for some coverage. Over all I was happy with my outfit and had lots of fun Salsa dancing. Next night of dancing will be at Club Bounce...oh boy I can't wait! Looking good girlie! Love that color on you!! You look fabulous in that dress!!! Btw, I always wear cardigans or something over sleeveless dresses too. Not only am I gincha pero I have the dreaded wing arms LOL pero que se puede hacer except love our body in all its glory verdad? Abrazos!